This is a post I've been dreading. We had to put our dear companion, Kali, down today. She has been sick for a while and we felt it was time. She would have been 14 years old in two weeks and was the best dog anyone could hope for. She was a friend to anyone who came in contact with her. Kali is resting at her favorite place, our cabin in Cherry Creek, NY. She loved to roam the land and swim in the pond. 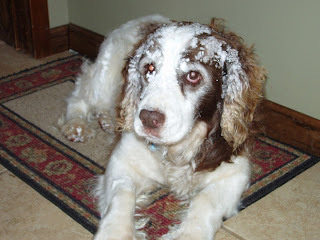 Kali will be missed terribly, but we are certain she is with her other friends now, frolicking in a better place. Rest in peace, Kali. We love you. I can't believe it's been over a week since I've last posted! Sorry, but I've been really busy here! Tomorrow will be the third party I've hosted at my house since Monday, St. Patty's Day! My MIL broke her arm, so I hosted St. Patty's Day at my house. She always makes reuben sandwiches for us and my SIL and her family. It's a tradition with my husband's family. We made 24 sandwiches that day for nine of us! And, of course, last weekend I was making sure my house was clean...washing floors, woodwork, you know, the traditional *spring cleaning*! Then on Thursday, I had my family over for my mom's 79th birthday! And tomorrow, just my in-laws and my mom are coming over for dinner. Right now I'm making my late grandmother's cheesecake. It's more of an old-fashioned cheesecake made with a yeast dough and farmer's cheese and cottage cheese for the topping. It is my all-time favorite dessert! I'll take a picture of it when it's done and post the recipe. It's out-of-this-world (at least in my opinion)! Gram would be proud that I'm keeping up the tradition. I only make it at Easter and Christmas, like Gram did. Anyway, that's what has been going on with me! This is the Easter card I made for my mom and my in-laws. It's similar to this one I posted earlier, but I fancied it up a bit with the ribbon and made it bigger. I always make bigger cards for the in-laws and Mom! 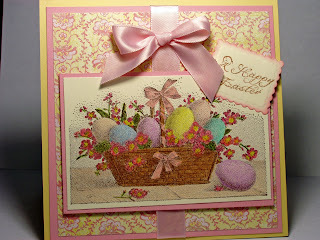 This stamp is from Paper Inspirations called Easter Basket. I stamped it in chocolate chip on vanilla and used Prismacolor pencils to color it. The dp is Basic Grey's Two Scoops. The sentiment is from another Paper Inspirations unmounted set called Chick on an Egg and is stamped in close to cocoa. Here is a card I made with that set. I used the scalloped rectangular nestabilities to cut out the sentiment and ran it through again to emboss it. I sponged the edges with pretty in pink ink. The other cardstock is SU's barely banana and pretty in pink. The ribbon (which is Offray satin ribbon, I believe, from Walmart) was first just wrapped around the panel and then I took another piece, made a bow, then attached it with mini glue dots. Thanks for stopping by and Happy Easter everyone! This is one of the cards we'll be doing tomorrow at my stamp club. I cased this card from Mary Fish's blog. I wanted a softer look, so I changed the colors. The *egg* is actually the balloon from Birthday Whimsy, one of the free sets from SU's sale-a-bration catalog. It's cut in half with the zig-zag scissors. Isn't that a great idea? I thought so! I colored the stamps with markers. Mary did that and also used the Versamarker to emboss the image. I didn't do that because I thought it would be too much for 10 girls to do...too involved! 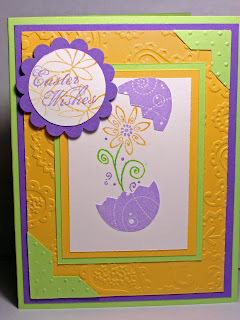 But check out her blog to see how to emboss with SU markers. The colors in real life don't look as bright as they do in the picture. They really do look nice together! Tomorrow is my good friend Eileen's 50th birthday! I just got this Time for the Bubbly set from MFT, and thought it would be perfect as we are planning on getting her a spa gift, too! I did the paper piercing technique on this so I could use the dp as *wallpaper*. I first stamped the image on SU's new Afternoon Tea dp and then stamped it again on whisper white. I used my copic markers to color the tub, legs, rug, and mirror. I used a silver pen on the mirror to get the shiny mirrored look. Once colored, I cut the tub and floor out together, then cut out the mirror. I adhered them directly to the dp (over the image I had previously stamped). The bubbles are covered in Crystal Effects and glitter. I did lots of layers in groovy guava, chocolate chip, and sky blue. I used my new Swiss Dots cuttlebug folder for the large blue mat. The yellow marvy circle and oval punches were used for the sentiment. I also stamped *Relax* on the mirror. I used the slot punch to bring the ribbon through. In hindsight, I would have tied the ribbon higher or put some brads on the empty space in the right corner. The ribbon is slightly covering the sentiment. Not a big deal, and I am happy with this one! Thanks for stopping by and let me know what you think! My DH, the dogs and I went out to our cabin today in Cherry Creek, NY. When we got there, the street wasn't plowed and we were disappointed. So we turned around and started back, and then saw the plow. I couldn't believe the amount of snow! 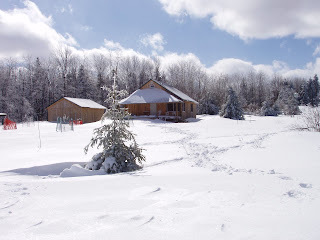 We had to walk through the snow to the cabin. 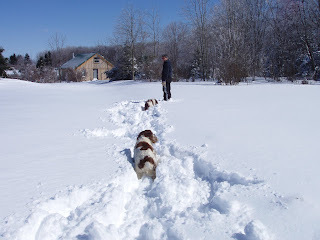 This is a picture of my DH and the dogs walking through the snow. I didn't think Kali (the one lagging behind) was going to make it! Thanks for stopping by! I should have a card done later either for the Featured Stamper challenge or my girlfriend's 50th birthday ! 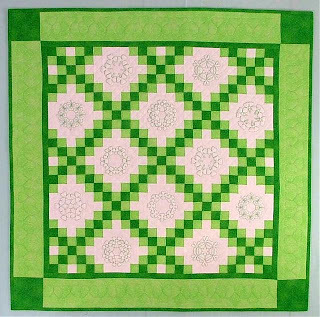 Today's Inspiration Challenge IC118 on SCS was this Double Irish Chain Shamrock Quilt. I took the diamond pattern from this quilt to create this card. I used PTI's Borders and Corners Monogram Edition for the diamond shape. Placement was so easy to do because of the clear stamp! The rest of the stamps are Studio G $1 stamps from ACMoore! The larger shamrocks don't get very good coverage like the better quality acrylic stamps, but for $1, they worked just fine. The tiny shamrocks around the border are from the same line. There are about eight of them in a line, and I just stamped them for the border. They really worked out wonderfully. 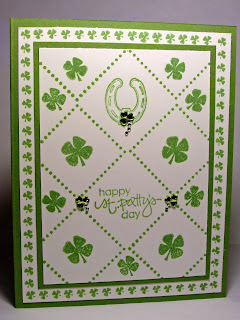 The card needed something, and I remembered these shamrock jewels I purchased at JoAnn's. There is a shamrock on the horseshoe, so I put one there and two near the sentiment. (Are there too many shamrocks on this card? Can there ever be enough for St. Patty's Day? Hmmm...) This literally took 10 minutes to make and maybe 5 minutes to decide which stamps to use (I have about three sets of these St. Patty's $1 stamps). I think I'm going to send this to my friend in Ohio whose last name is O'Donnell. I think that's appropriate! Happy St. Patty's day and may the luck of the Irish be with you! This is Lizzie in our backyard looking for her toy after I threw it! She looks like an ostrich! See the snow? Not much for our area, but it is March 8 already! This one is the last, I promise! Of all the pics I've taken of Lizzie, this is my all-time favorite! She was only a few months old and it was taken at our cabin in Cherry Creek, NY by our pond (does this land look familiar, Cheryl?). Look at that face and that dirty nose! She is the sweetest dog (next to Kali, of course)! Scroll down for my other *dog* posting! Well, thanks for letting me go on about my dogs. We have no children, so this is the next best thing! Have a great weekend! Sorry I haven't been around all week. I've been busy, sick, and working on these shower invitations, so I haven't had time to work on fun stuff! I wanted to post this earlier, but blogger was down. I've wanted to post some pics of my dogs. Some of you have mentioned the pic of me with my puppy, Lizzie. 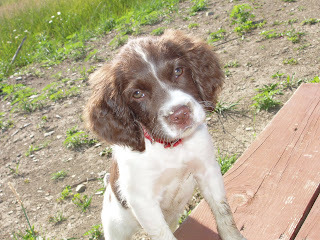 That was when she was 3 or 4 weeks old when we went to pick her out of the litter. We got her when she was 6 weeks old. She is now 10 months and full of so much energy and fun! My other is almost 14 years old, and her name is Kali. They are both Springer Spaniels. Kali is a very special dog. Everyone has loved her since we first got her. She is much more mellow (always has been) and I think that is why everyone always loves her. She is very approachable and so, so well-behaved. Not that Lizzie isn't (well, most of the time), but she is still a puppy with A LOT of energy. She likes to chew my DH's socks, underwear (I know, ugh! ), and t-shirts that he leaves on the basement floor! 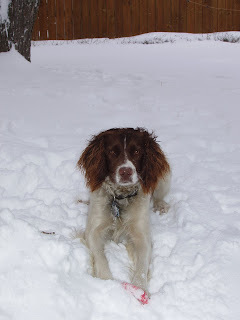 Anyway, the Buffalo and surrounding areas got some snow this weekend, so I thought I'd post pics of the dogs and the snow. This is Kali after being outside snowblowing with my DH! She is a very loyal dog and will sit out in the snow for HOURS waiting for my DH. Everyday around 3:30 she goes out front and waits for him! It's kind of annoying cause she doesn't do that for me! 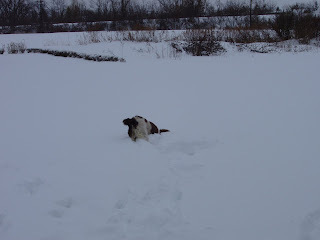 This next picture is Lizzie with her red toy (can you see it in the snow?). I just threw that thing for her and she was waiting (and posing-she loves to have her pic taken) until I threw it again! I have two more to post, but it will have to wait. Blogger is being very testy today and won't let me upload anymore pics! Stop by later to see them! I also got 6 more Copic markers in today's mail from my Copic club over at Gina K designs! These are in the beige/brown tones! Getting closer to that 36 number! I also got my signature from this website. I saw it on Lauren's website. Check it out, it's pretty cool! See you later with those pics and hopefully some cards! Today's Featured Stamper (FS56) on SCS is Mary Fish aka Petal Pusher. Her gallery is full of great designs and I chose this one to case today. There were so many, but I did this late Sunday night and wanted something quick and simple. Everything was very simple except for the Jumbo Eyelets from SU. I've never used them before, so I was ready today. But I wasn't sure which setting to use on the cropadile, and my paper creased! Ugh! I wasn't going to waste two perfectly good eyelets, so it stayed (hopefully you can't see it very well)! The rules for Featured Stamper casing is to change at least two things. I changed the stamps and cuttlebug folder and used barely banana instead of river rock. For some reason in her picture the river rock looked good with the chocolate and sage shadow, but I didn't like it personally, so I changed it! 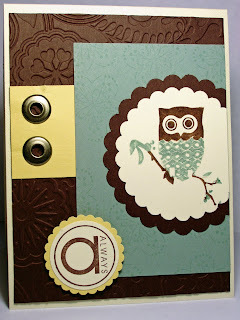 I colored the owl with my markers: first in chocolate, stamped it, then in sage shadow and stamped again. This is a clear stamp called Birds Galore by Inkadinkadoo, so it was easy to do (no stampamajig needed). I've been wanting to use that owl because I think he is so cute and always a hoot! Thanks for stopping by! My girlfriend asked me if I would help her make these party favors for her friend's daughter's sweet 16 birthday party. I made these for Valentine's day and she loved them and wanted to make something similar for this party. These contain one each of the Nestle Treasures candy instead of the Hershey Nuggets because the wrapper on them was purple and she wanted to use these colors. We cut the lavender lace and gable green cardstock to 1 1/2" x 4 1/2 " and scored them at 1 3/4" and 2 3/4". The corners were punched with the ticket corner punch. 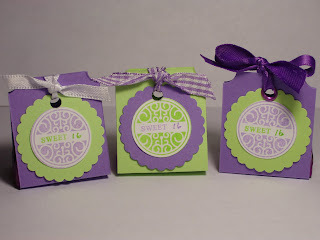 The main image was stamped in both green galore and lavender lace, as was the word "Sweet" using PTI's Sweet Love set. The number "16" was hand-written using the coordinating SU marker. The 1" punch was used to punch it out and it was mounted on the yellow Marvy circle scallop punch. So far, this project was easy. Then came punching the hole, putting the eyelet in, and tying the ribbon. Well, as you can see by the two on the left, the eyelet fell by the wayside, and the bow turned into a knot! You see, we made 75 of these and we just started cutting some corners for ease sake! They looked just as pretty! The Treasure candy was slightly smaller than the Nugget, so we had to put a glue dot on the bottom of the candy to make it stay in the wrapper. When we had them all done and in the box, they looked so cute! I hope everyone likes them and appreciates the time we put into them! Thanks for stopping by!